12 photos of this 1903 cruiser, chiefly famous for its role in Russia's 1917 October Revolution. Aurora, St Petersburg, 26 September 2004 1. 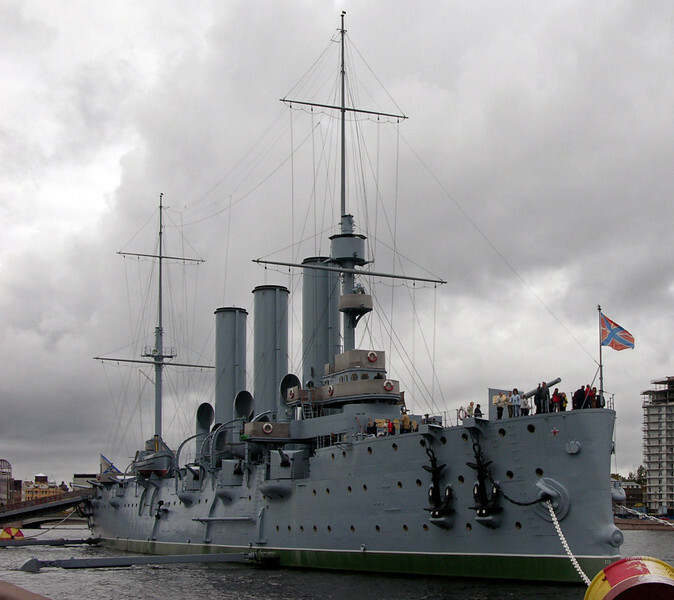 The Russian cruiser was built at St Petersburg and commissioned in 1903. In 1905 she fought in the Russo - Japanese war at the battle of Tsushima, where the Russian fleet was annihilated. Aurora escaped to Manila, from where she returned to Russia. She owes her survival to her role in the October 1917 Russian Revolution. A shot from the gun on her fo'c'sle signalled the Bolshevik assault on St Petersburg's Winter Palace, the start of Lenin's coup d'etat against the interim government which had ruled Russia since Tsar Nicholas II had abdicated the previous February.